Associated with a decrease in cellular ageing and prevention of numerous diseases (Alzheimer’s cancer, diabetes). Described as the most important endogenous antioxidant. This dietary supplement provides one of the most powerful antioxidants found in the body: glutathione. A tripeptide formed by cysteine, glutamic acid and glycine, this compound plays a key role in protecting our health. Present in every cell in the body, it combats the harmful effects of free radicals. In excess, these highly-reactive species cause oxidative stress which is responsible for significant cell damage. Stimulated by factors such as UV exposure, pollution, smoking, and poor diet, oxidative stress increases cellular ageing and promotes the development of certain diseases. This glutathione supplement has been developed precisely to stop this process. A powerful, natural antioxidant, glutathione has been the object of thousands of studies, many of which have investigated its protective effects and therapeutic potential. In the course of this research, scientists have observed the presence of low glutathione levels in many diseases. In particular, they have found abnormally low glutathione levels in cardiovascular, neurological, pulmonary, liver, kidney and digestive disorders, as well as in several types of cancer. Supplementing with reduced glutathione thus offers significant benefits in preventing deficiency, supporting the body’s defences and preventing certain diseases. Supplementation with reduced glutathione is also attracting significant interest in the field of anti-ageing medicine. By fighting oxidative stress, this antioxidant helps to reduce cellular ageing and prevent certain age-related health problems. Supplementation makes even more sense given that endogenous synthesis of glutathione has been shown to decline with age. 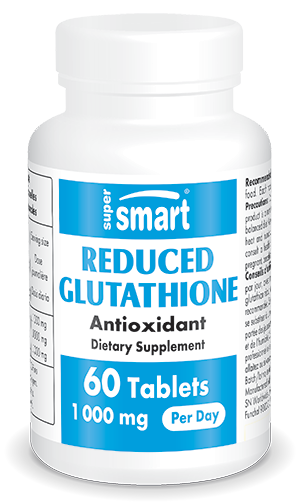 Recent studies suggest that glutathione may also have an immune-stimulant effect. It seems to be able to stimulate the activity of certain white blood cells essential to the immune system. As well as being a potent antioxidant, glutathione also plays a detoxifying role in the body, particularly in the liver where it helps eliminate heavy metals such as mercury and lead. To compensate for the decline in its endogenous production, glutathione is now available in its reduced form, which is to say its most active antioxidant form, as a nutritional supplement. When it reacts with free radicals, reduced glutathione (GSH) is converted into its oxidised form (GSSG). Glutathione’s antioxidant benefits can now be obtained with this dietary supplement which contains 500mg of GSH, with a suggested dose of one to two capsules a day. It is best taken with food and combined with other natural antioxidants in order to prolong its protective effects. To optimise the effects of this potent antioxidant, there is also a sublingual GSH supplement which is placed under the tongue for optimal absorption. Endogenous glutathione synthesis can also be stimulated by taking N-acetyl-cysteine and L-glutamine, two precursors of glutathione. Each tablet contains 500 mg pharmaceutical grade reduced Glutathione. Adults. Take one or two tablets a day with food, or as advised by your therapist.